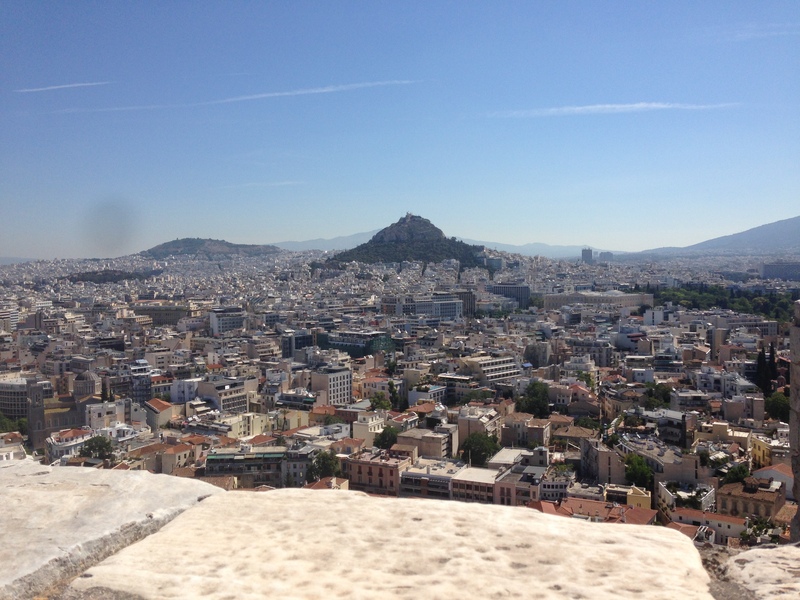 Cruising the Aegean – Day 9: Athens | Now, I'm Just Amused. 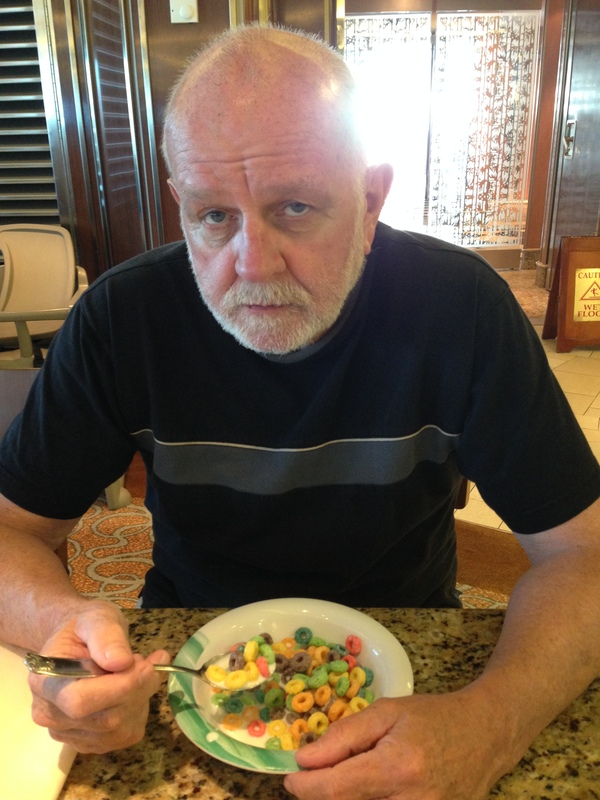 I’m not a morning person, really. 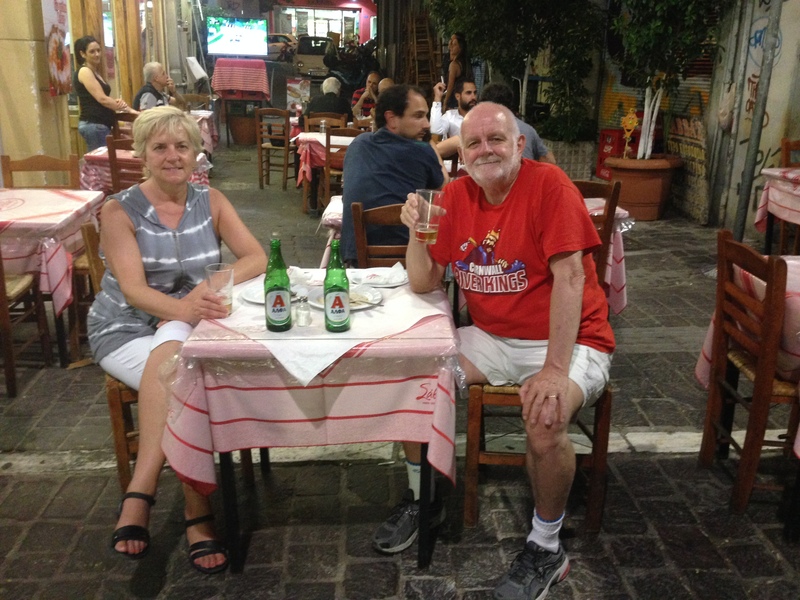 Sunday we woke up and had a nice breakfast at the hotel while awaiting the arrival of the bus for our “Best of Athens” tour. 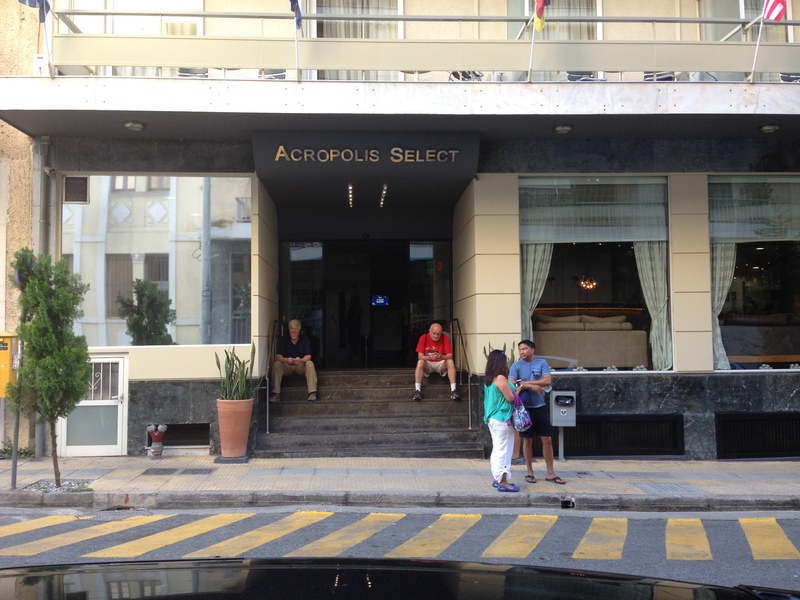 The Acropolis Select Hotel. 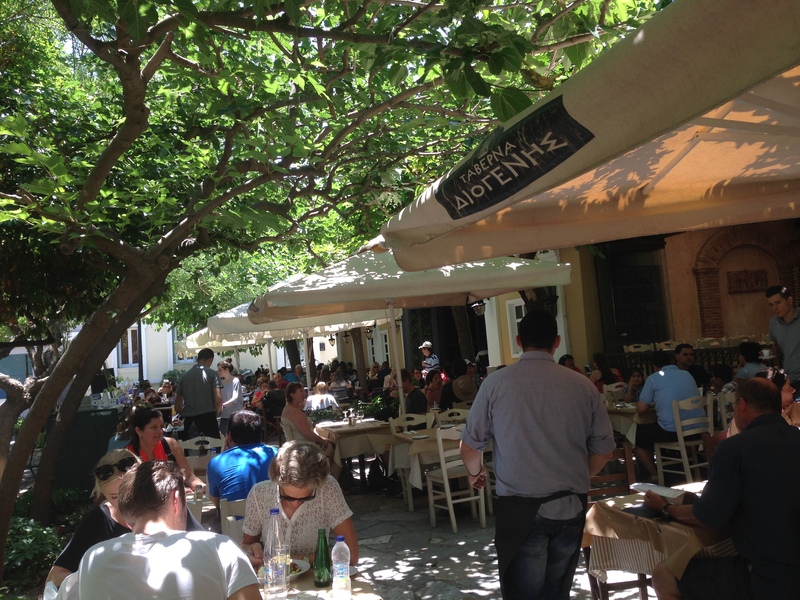 The tour leader had to walk us to the bus on foot, as the bus wouldn’t fit on Falirou street. Soon we were making the rounds, picking up folks at different hotels. 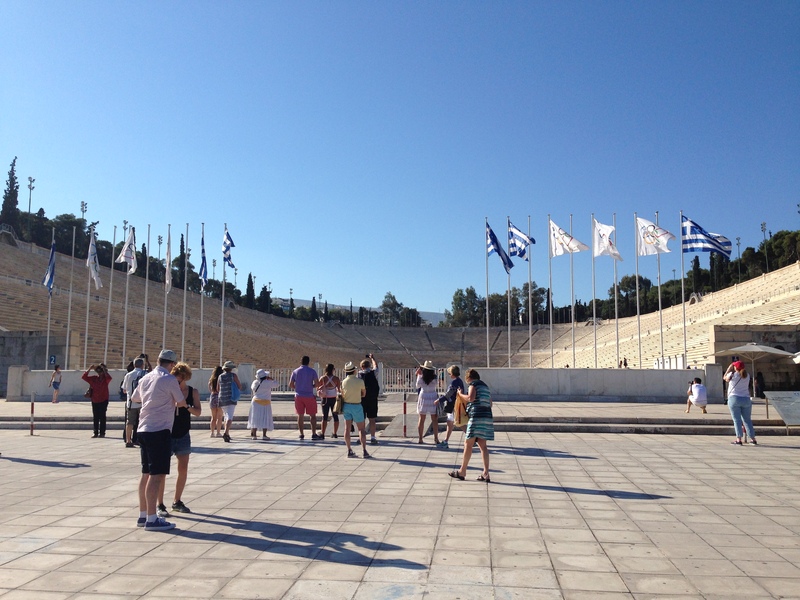 Our first stop was the stadium built for the 1896 reboot of the modern Olympics. Kind of blah. 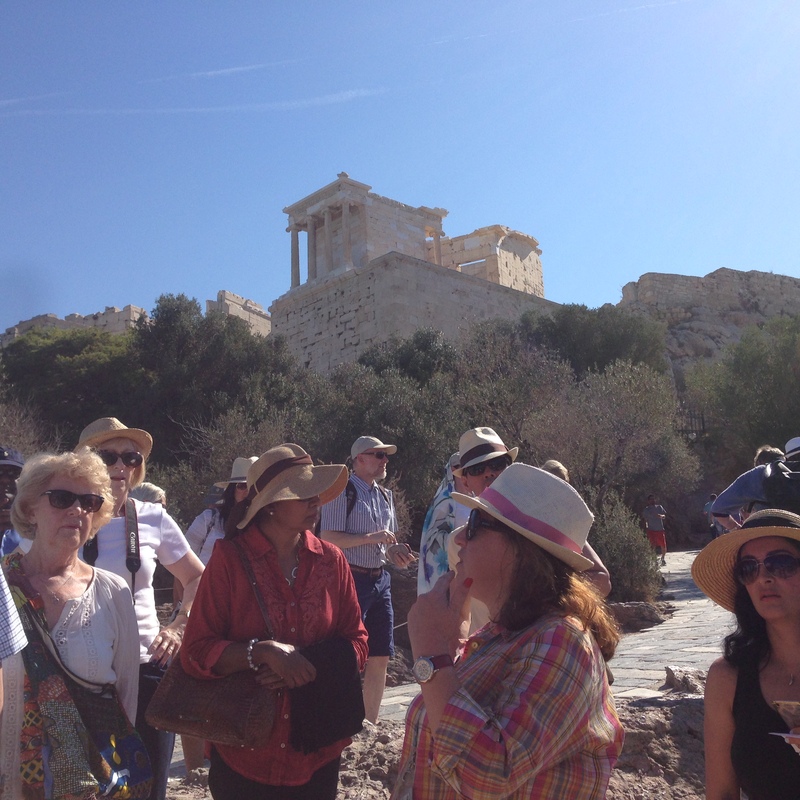 Then we got back aboard to head to the Acropolis. 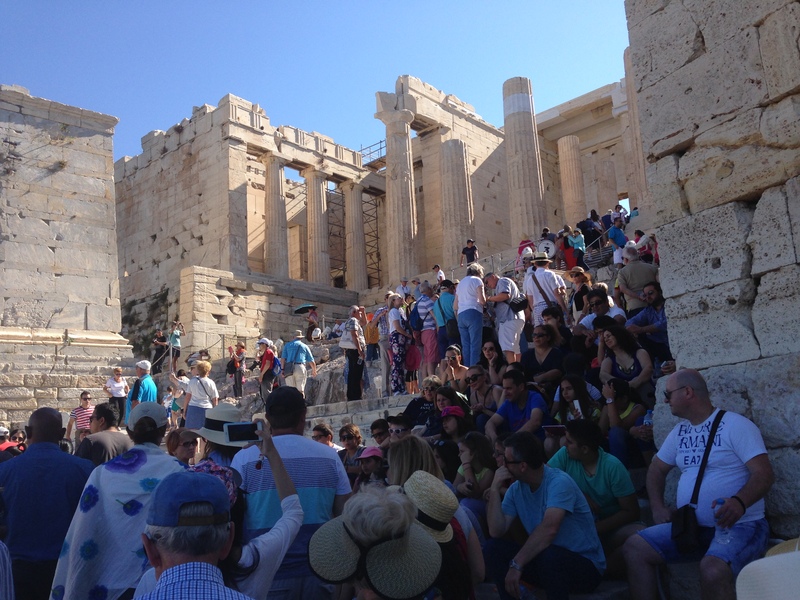 … the Acropolis was mobbed, possibly because it was Sunday. I also remember that we sailed past a bunch of parked cruise ships when we arrived in town yesterday. Both 2500 years ago and today, this marble stairway remains the main entrance into the site. 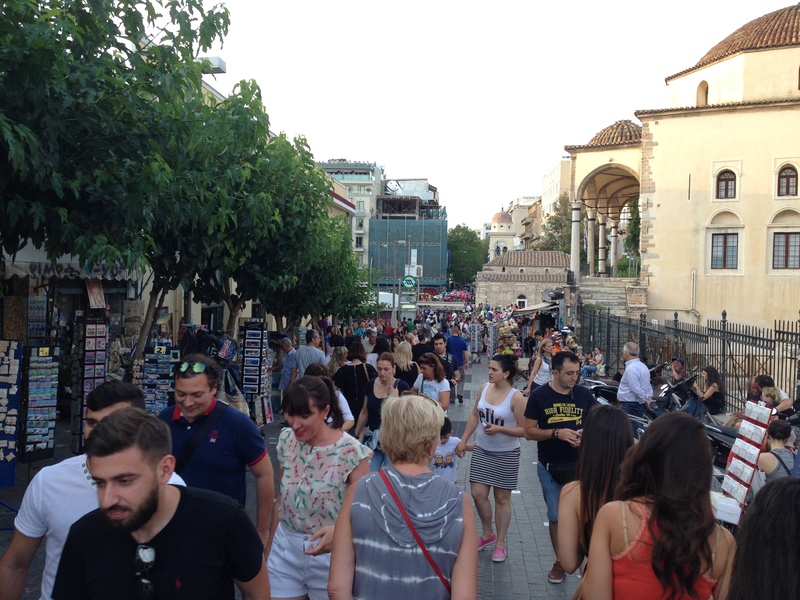 The steps quickly become clogged with picture takers, awestruck visitors and folks just exhausted from the climb up the hill. 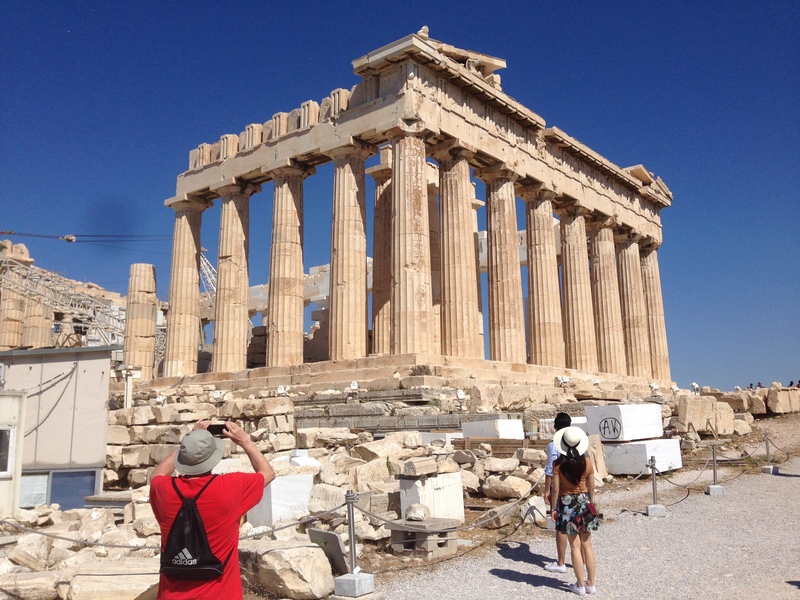 The views were spectacular, but we were literally tripping over folks backing up to take selfies against the Parthenon. Boy, tourists are annoying. The whole site is a “work in progress” as continuous reconstruction goes on. 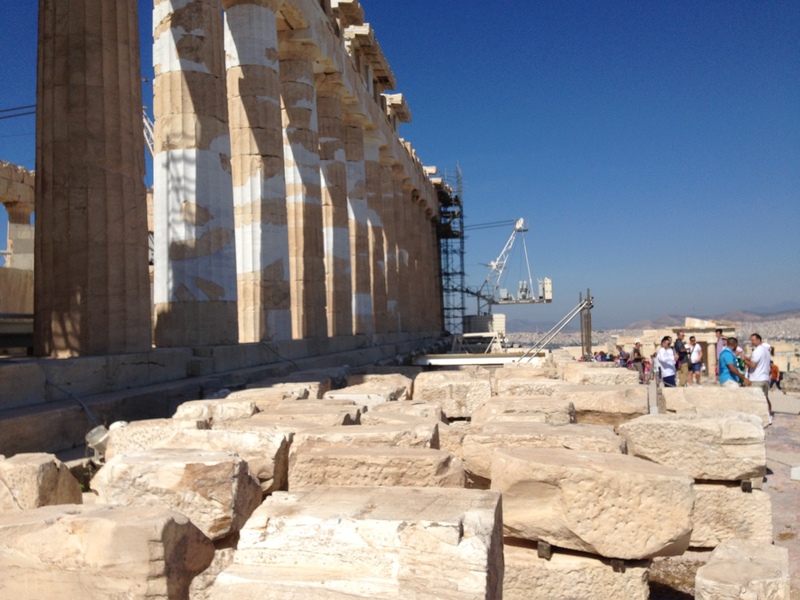 The Parthenon was huge and impressive. In essence, this is just a bunch of beautifully carved stones piled up on each other. Some of the facade and other parts were cemented in place, of course, but most of the structural integrity is dependent on gravity and inertia. And that has mostly sufficed for 2,500 years now. 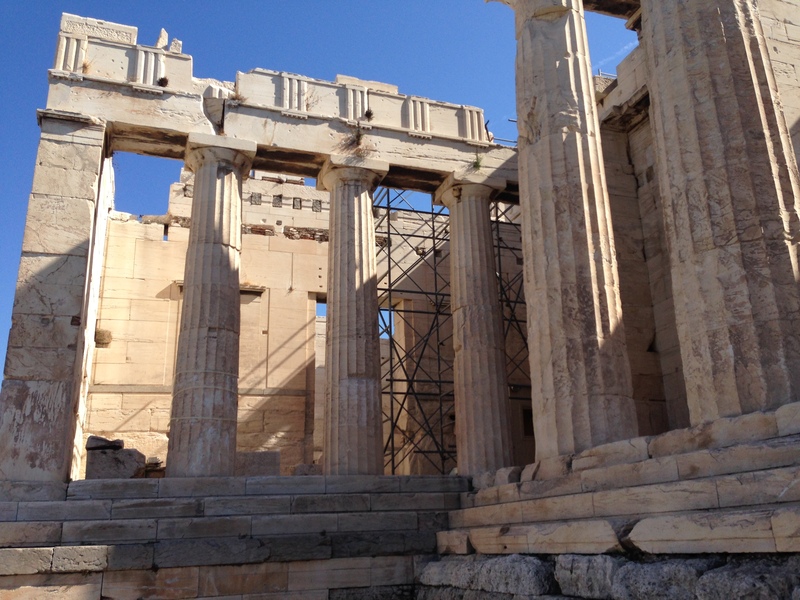 These are pieces awaiting cataloging and then assembly into the reconstructed Parthenon. It should take a while. 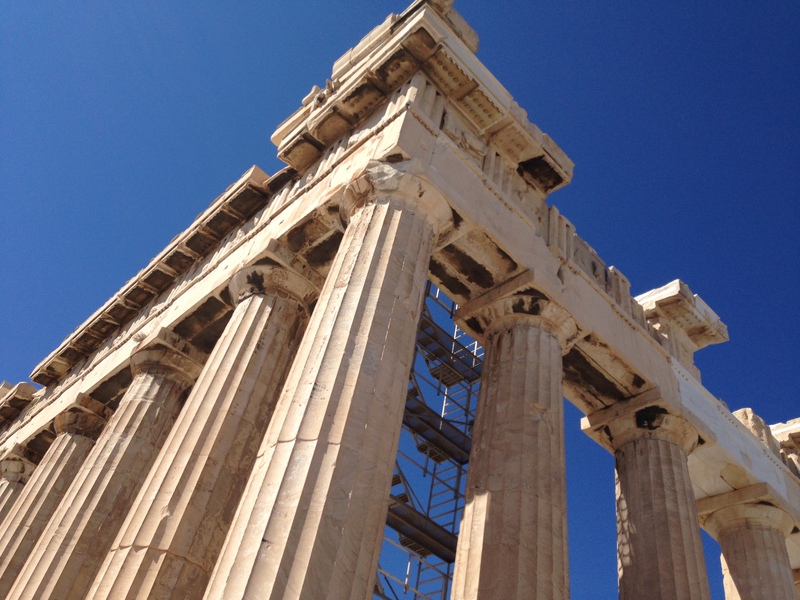 The Parthenon functioned as a pagan temple, a Christian church and a Mosque, depending on whoever was the latest conqueror. It also burned a couple of times and was pillaged by pirates and bandits and British antiquity hunters. Each subsequent rebuilding lost a little more of the original. 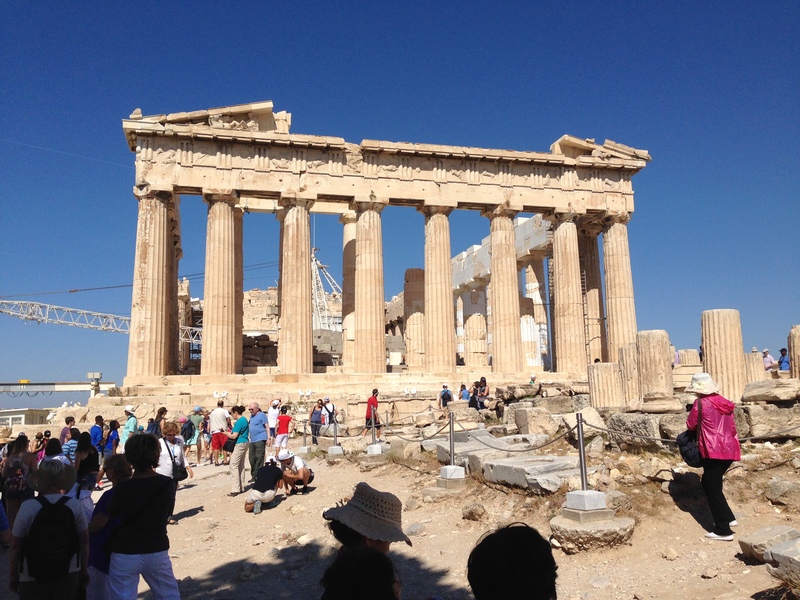 Then, in 1687, the Ottomans used the Parthenon as a gunpowder magazine during their war with Venice. 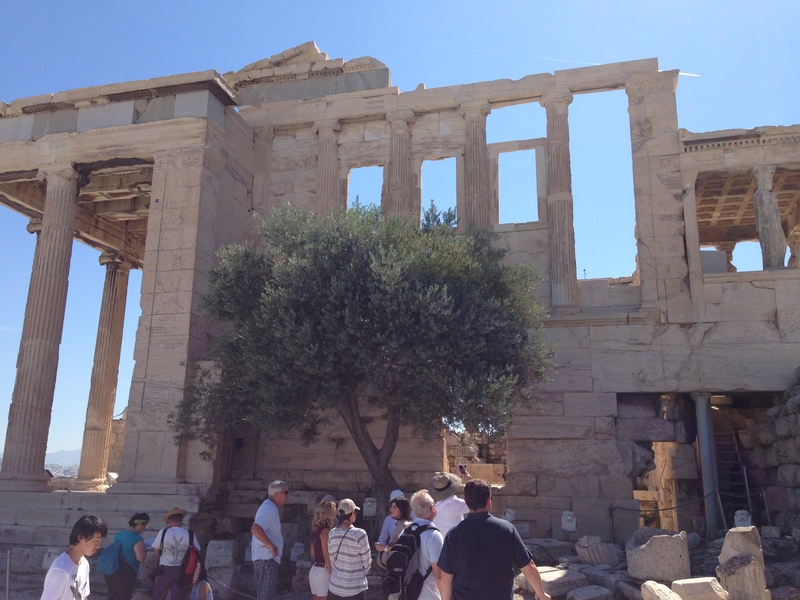 A direct hit by a Venetian mortar killed 300 Turks and left the Parthenon pretty much as we see it now. 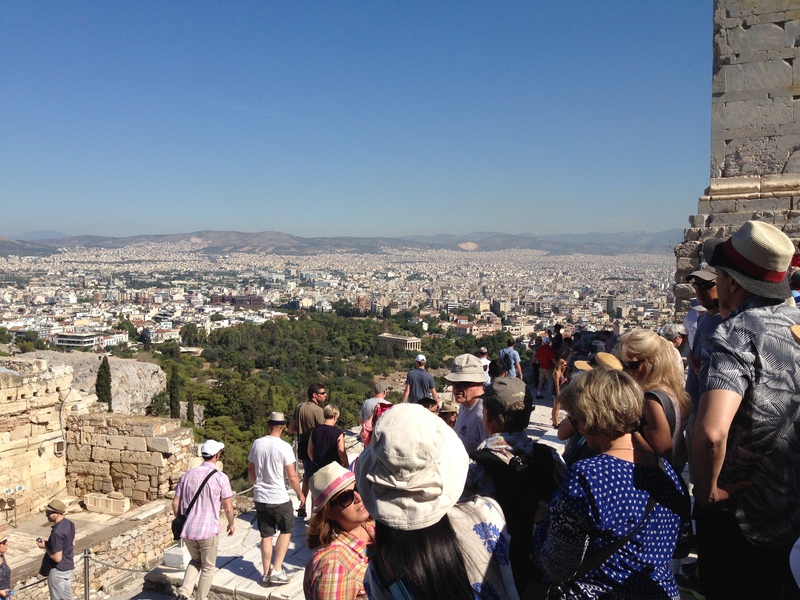 Each of the hills that you see from the Acropolis has some kind of ancient structure on it. It seems everywhere you turn in the old town, there is an ancient something-or-other poking up through the street. 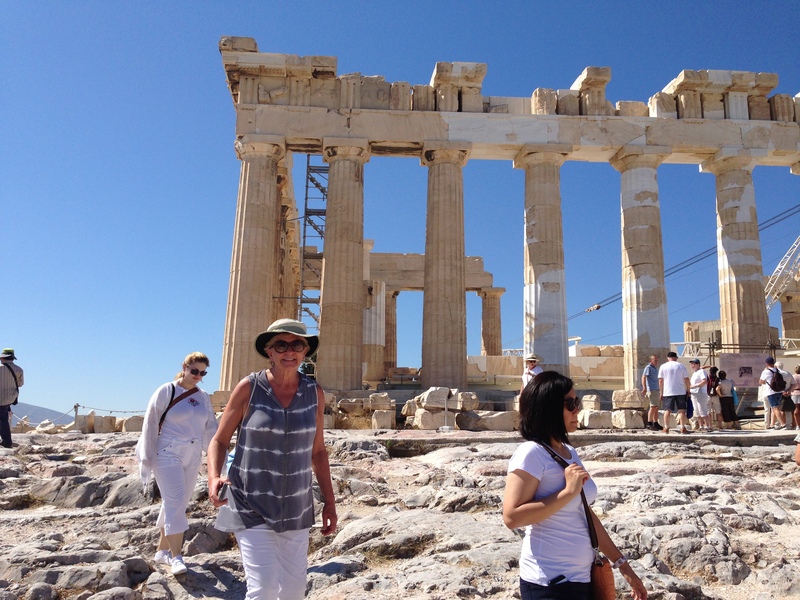 Tourists backing up to take a selfie with the Parthenon in the background. Yes, I remember what I just said about that. The footing was difficult in many places. 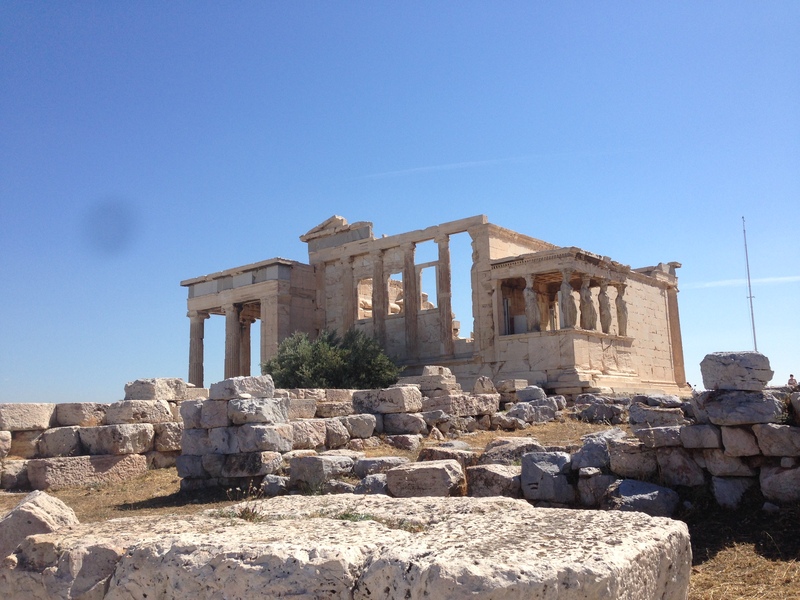 This is called the Erechtheion. 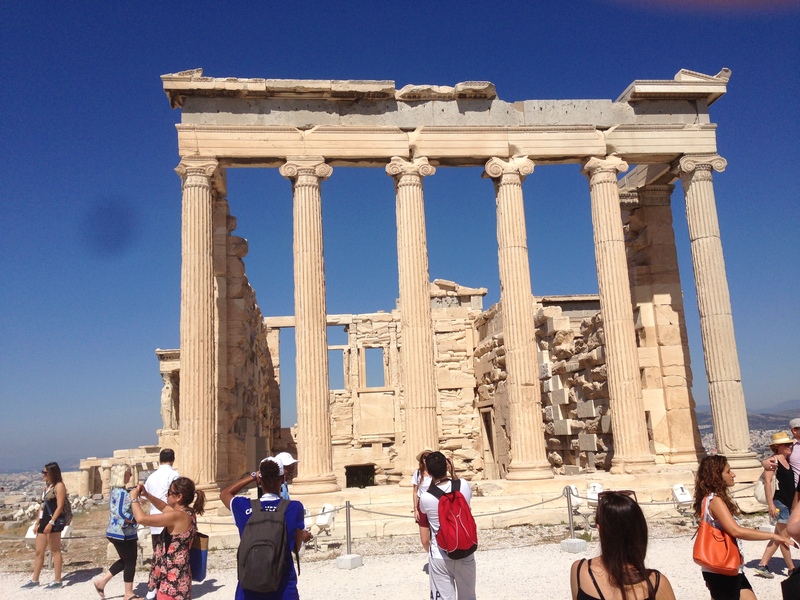 Wikipedia: The Erechtheion or Erechtheum is an ancient Greek temple on the north side of the Acropolis of Athens in Greece which was dedicated to both Athena and Poseidon. 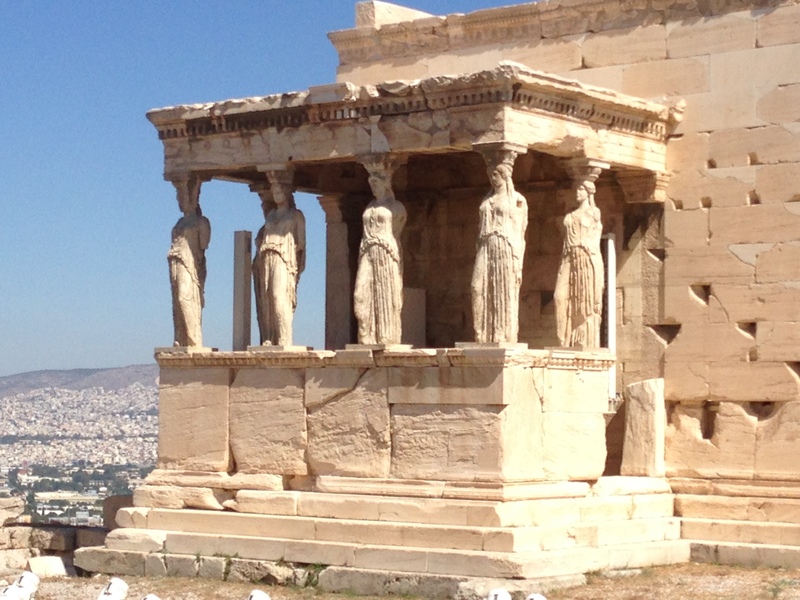 These are the Caryatids on the south porch of the Erechtheion. A Caryatid is “a stone carving of a draped female figure, used as a pillar to support the entablature of a Greek or Greek-style building” (Wikipedia). 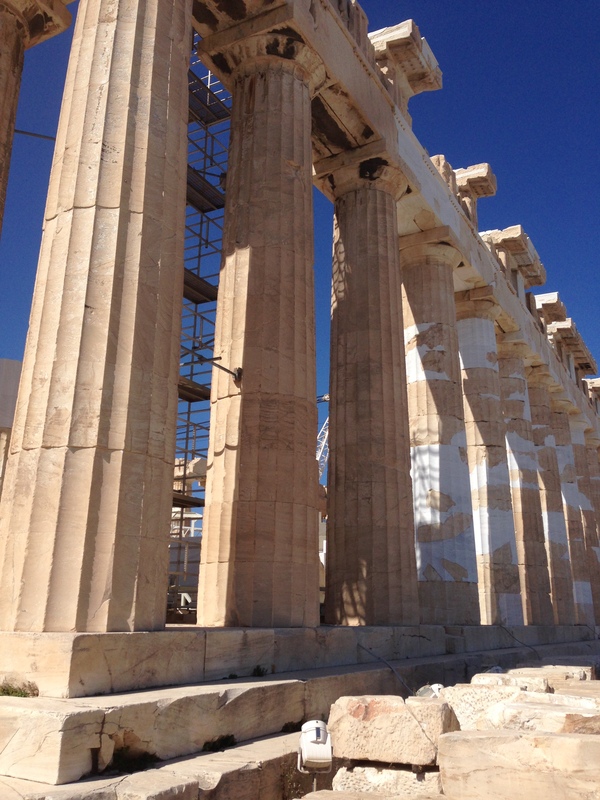 These are reproductions as the fragile originals have been moved into the adjacent Acropolis Museum. The holes you see chiseled into the walls everywhere show where looters dug out the metal fasteners holding the blocks together. By this point, finding a shady spot to think about what you are seeing becomes important. It was a bit of a hike up here and it’s about 90 degrees with a cloudless sky. 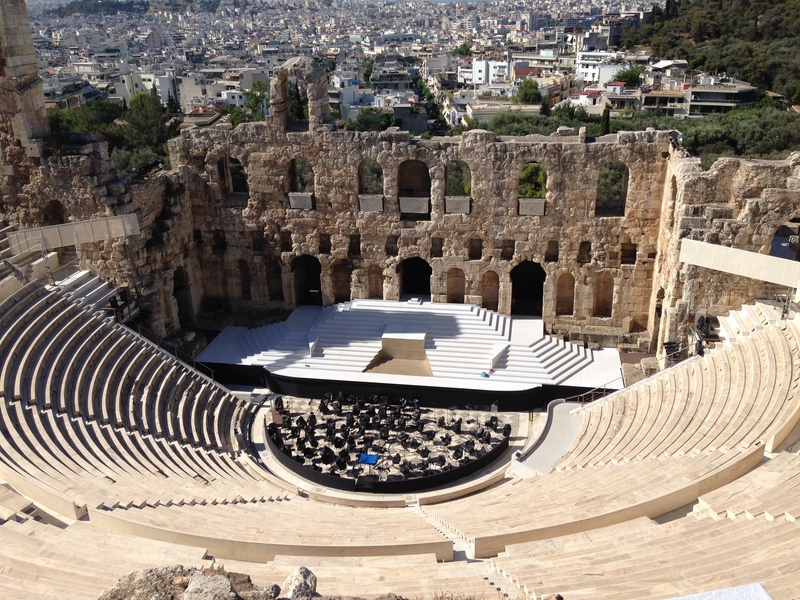 We could look down on the Theater of Dionysus Eluthereus, which dates to the 4th century BCE. Since our guide told us our tickets would be honored again tomorrow (and the hotel is only a ten minute walk away) Betty and I decided to skip climbing down to see it and come back tomorrow. 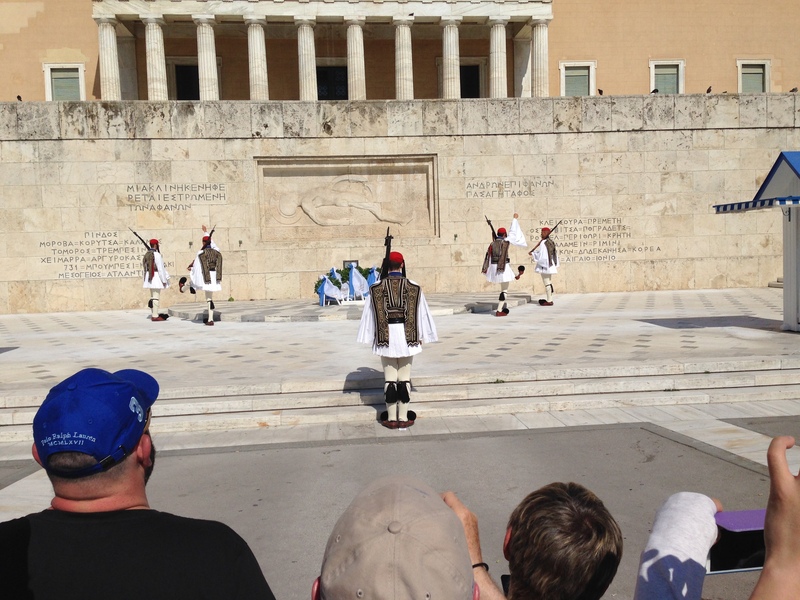 It’s the changing of the guard ceremony at the Tomb of the Unknown Soldier. 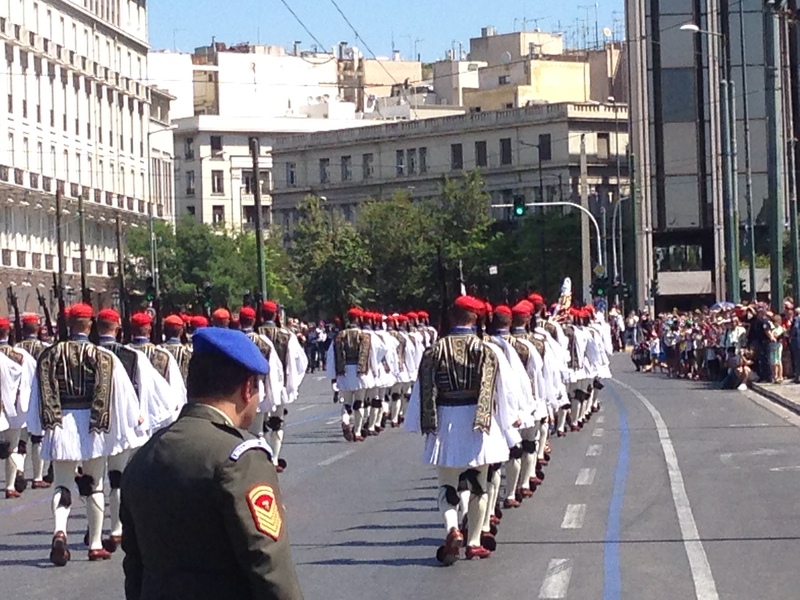 The Greek soldiers made quite an impression, with their traditional costumes and their hobnailed boots scratching against the pavement as they marched. 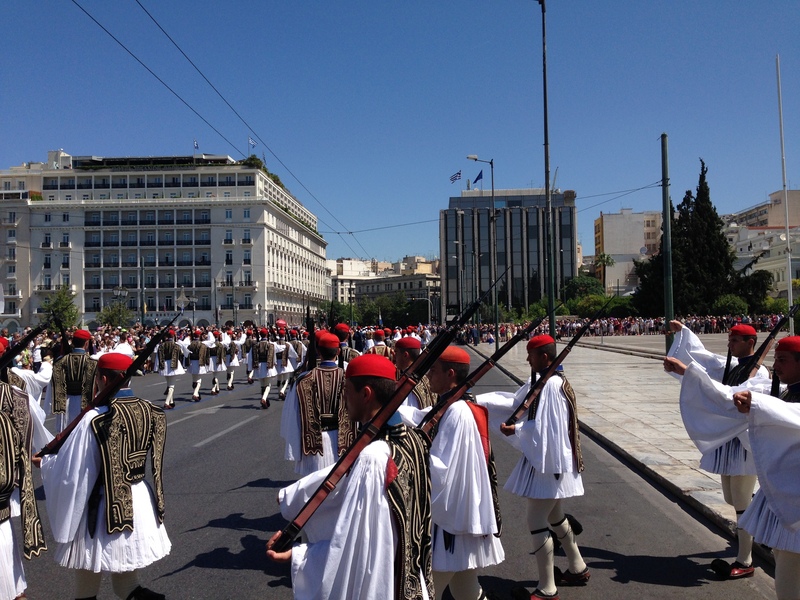 We just caught the end of the ceremony, which happens every Sunday morning at 11. 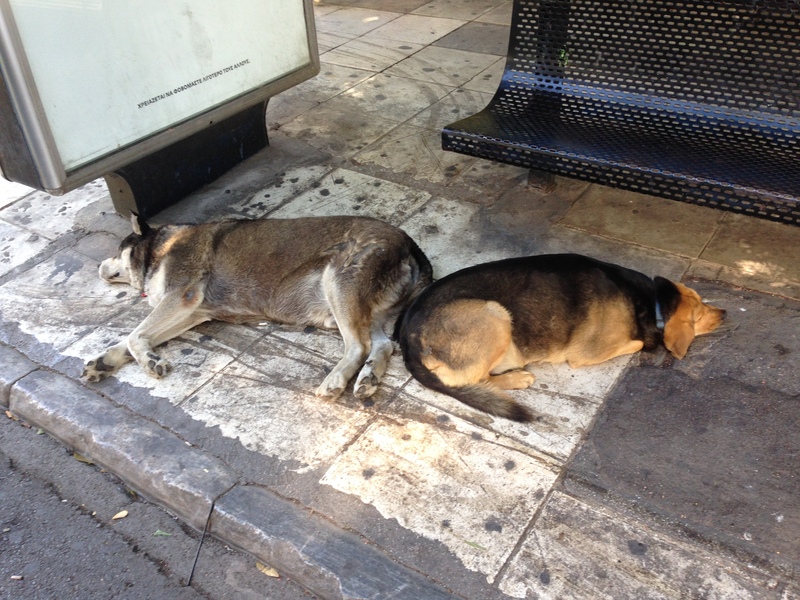 While hundreds of tourists milled about enjoying the pomp and ceremony, I found two local residents who have evidently seen it all before. 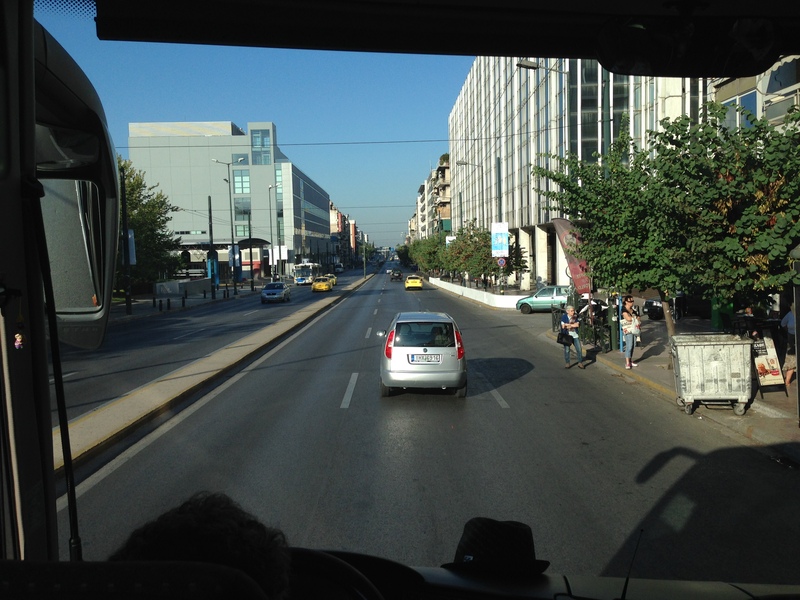 The barriers came down, traffic started honking and moving, and we scrambled back on the bus to head for the museum. 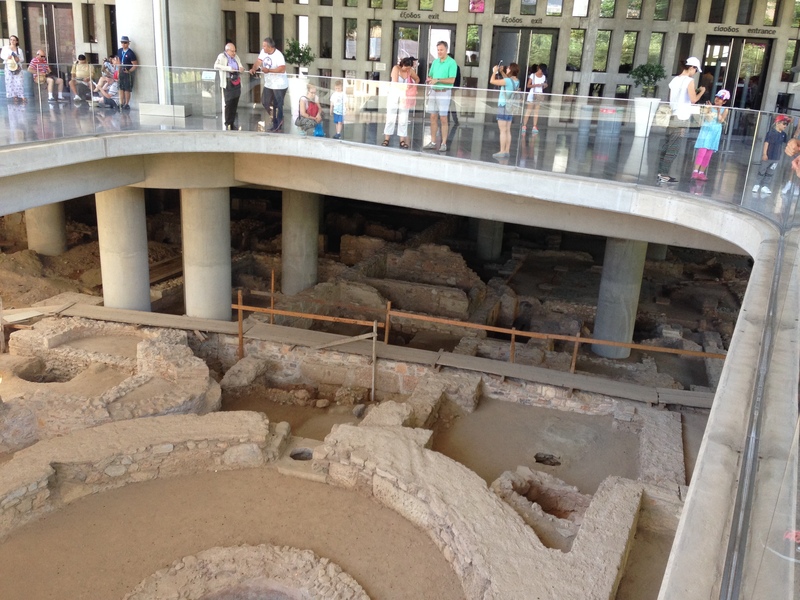 When the new museum was being built here at the foot of the Acropolis, it was a sure bet that the excavations would uncover many interesting things. This is the remains of a church from the early days of Christianity. The entrance area to the museum was constructed as a bridgeway with glass floors to allow viewing of the newly discovered ruins. The museum itself was very interesting. 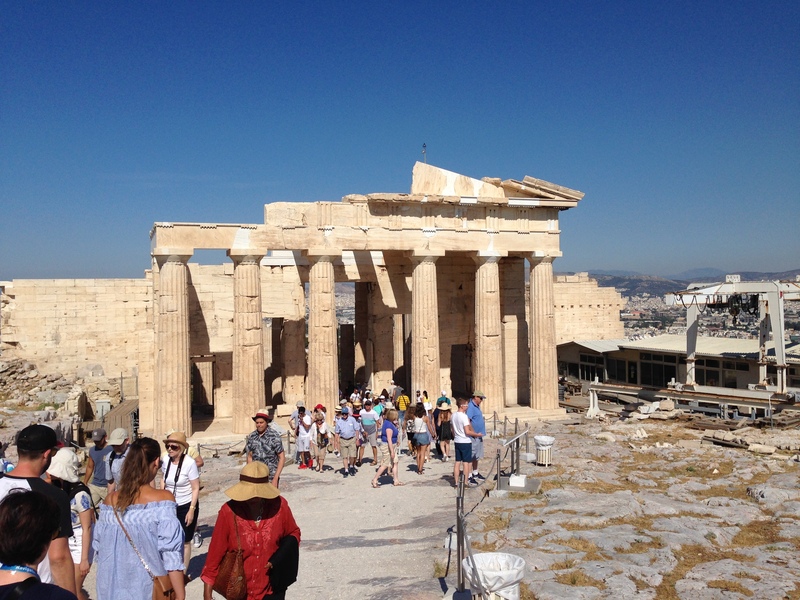 It displayed many of the original artworks from the Parthenon and other Acropolis temples in a controlled environment with lots of explanatory signage. But photography was only allowed in a few rooms. 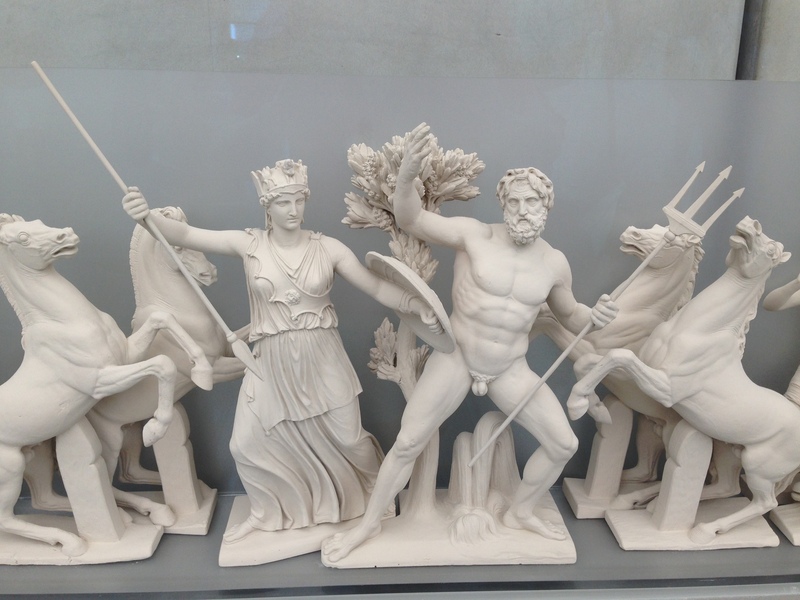 This is a model of the sculptures originally on the west pediment of the Parthenon. Wikipedia: The west pediment depicted Athena and Poseidon during their competition for the honor of becoming the city’s patron. Athena and Poseidon appear at the center of the composition, diverging from one another in strong diagonal forms, with the goddess holding the olive tree and the god of the sea raising his trident to strike the earth. 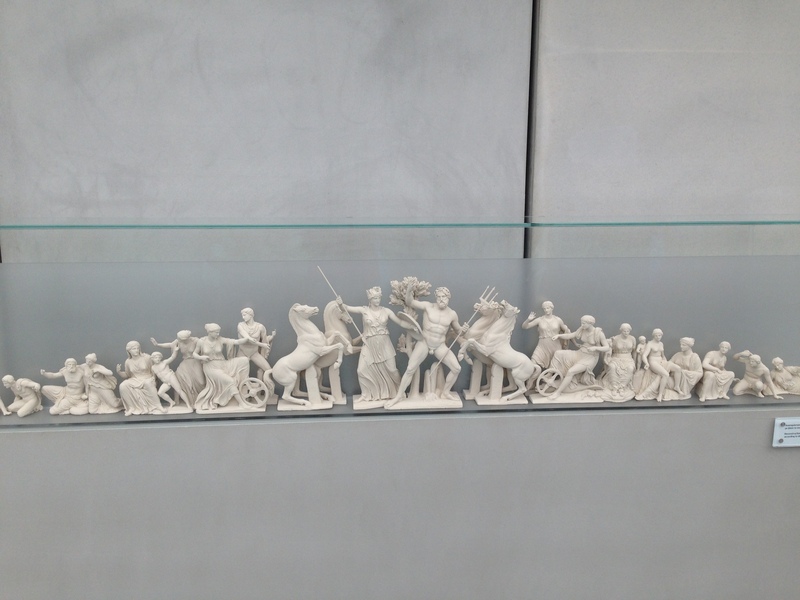 At their flanks, they are framed by two active groups of horses pulling chariots, while a crowd of legendary personalities from Athenian mythology fills the space out to the acute corners of the pediment. A detail from the same. 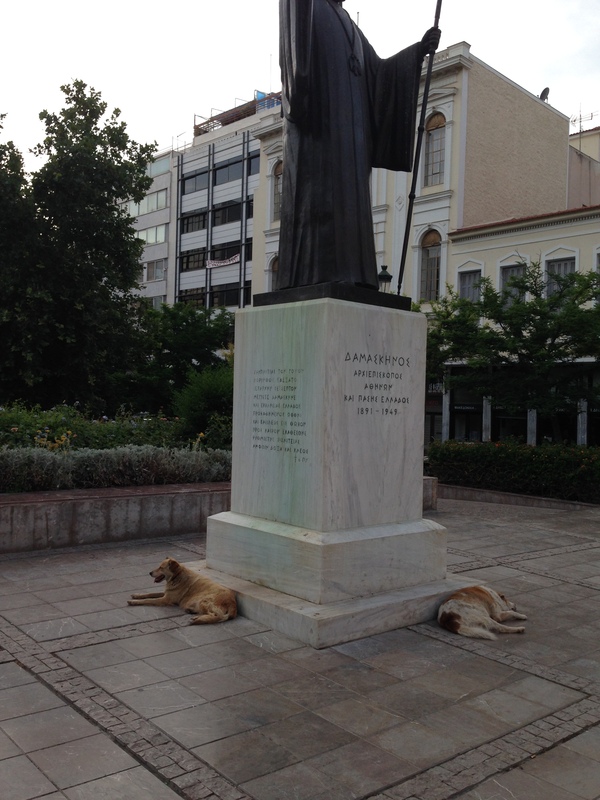 Looks like Athena is a bit overdressed somehow. 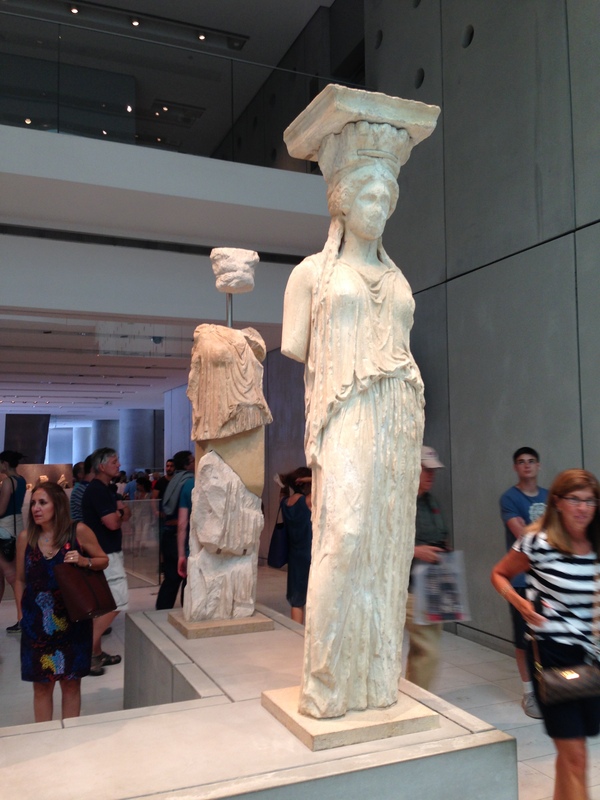 The genuine Caryatids rescued from the site. It is repeatedly mentioned in the signage how many treasures belonging to Greek heritage somehow wound up in the British museum. 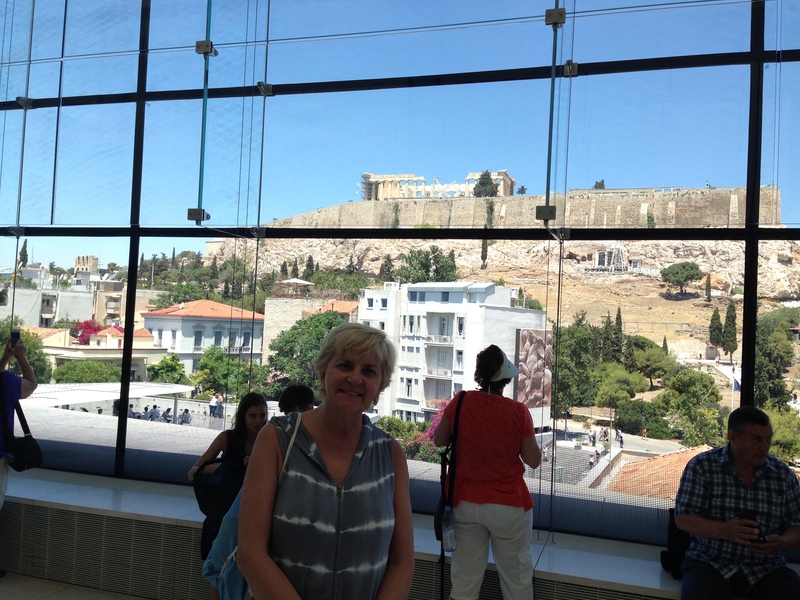 The view to the Acropolis from the museum. Well, that’s enough cultural uplift for one day. 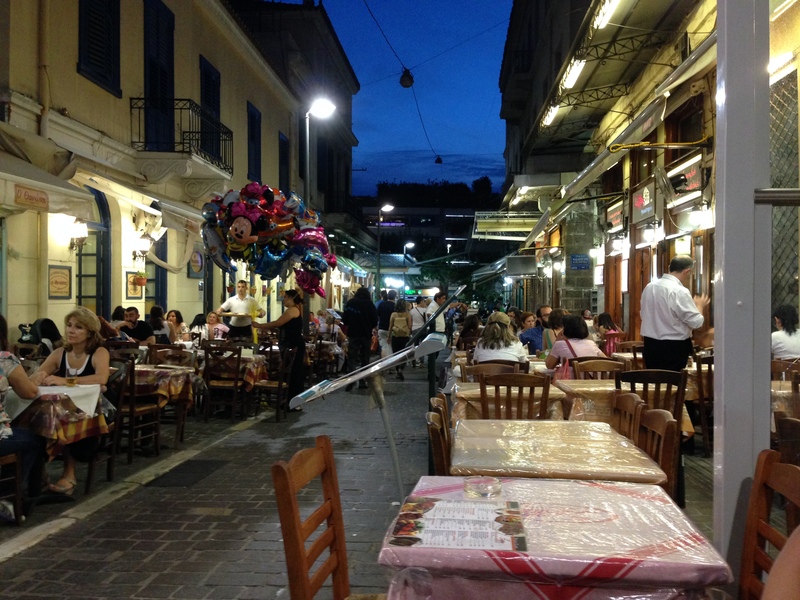 We left the tour and walked back into Plaka, “our” neighborhood. 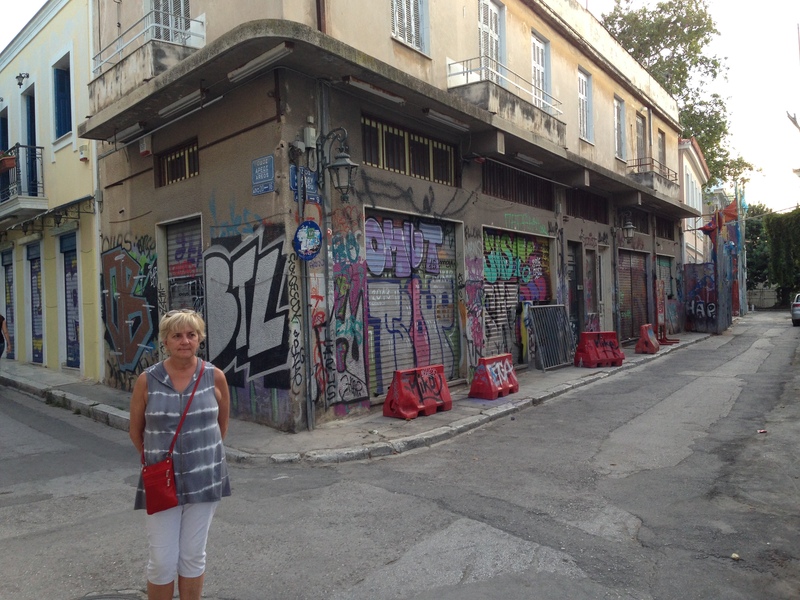 Like many places in Europe, graffiti seems to be still all the rage. Back home, it seems out of fashion now. 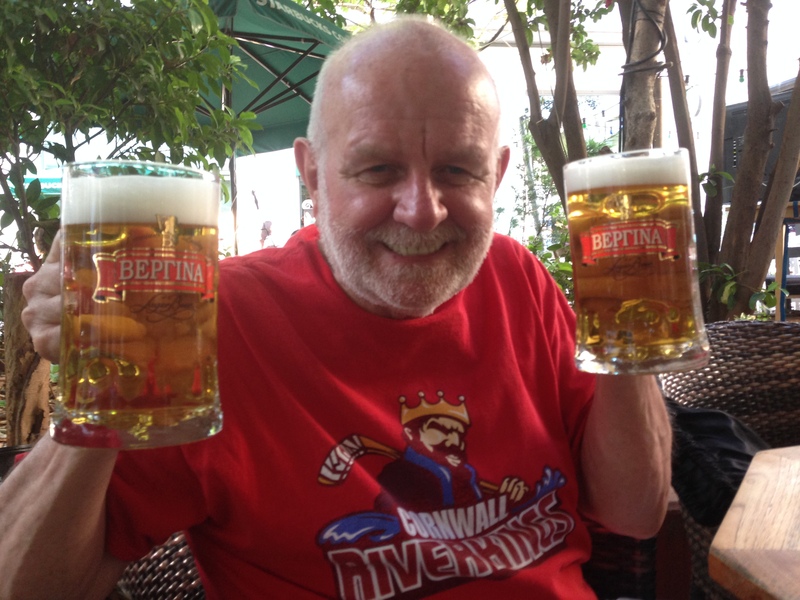 … and I said beer, right? As night falls, we walk past the Temple of someone or other. 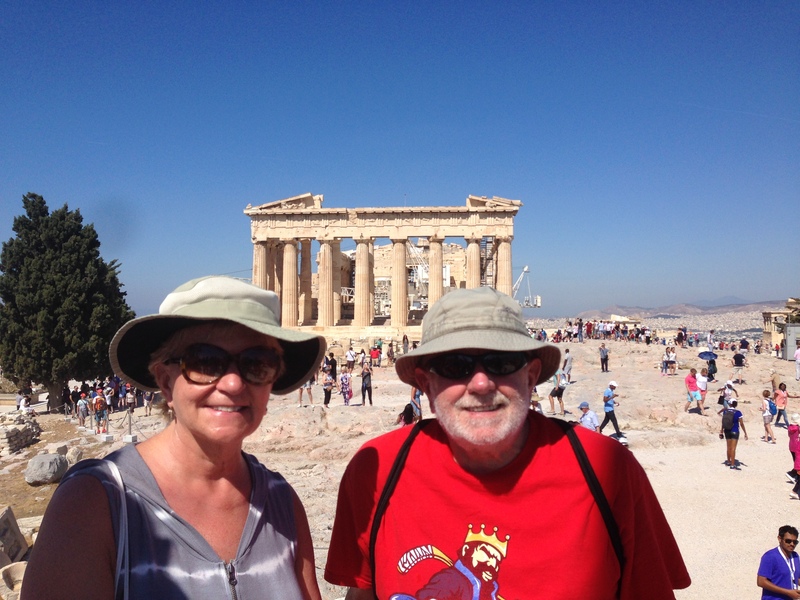 Note the Parthenon, shining like a beacon on the hilltop. Soon it was time to call it a day. 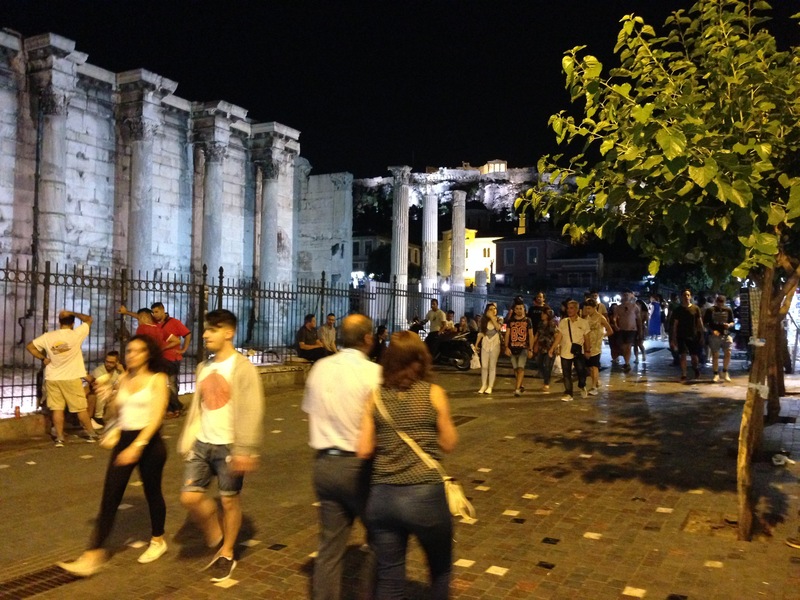 Tomorrow we hope to see the Theater of Dionysus, ride the subway and check out the rest of the city.